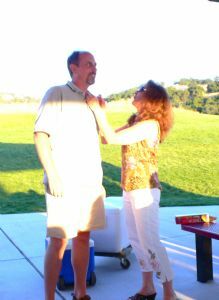 Bill Tobin officially took the leadership reins of the El Dorado Hills Rotary Club on July 1 at Promontory Park. The informal barbecue was a family affair as Prez Tobin stood on a picnic table to deliver his inaugural address. 2009 President Kathy Witherow received kudos for her service.